The classic mashed potatoes is an easy recipe to prepare and it is a rich side dish that can accompany roasts or fishes. 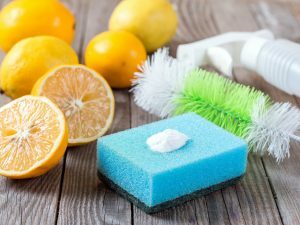 It can also accompany grilled carrots and zucchini. The potatoes must be white because they are more floury and they are excellent for this kind of recipe. 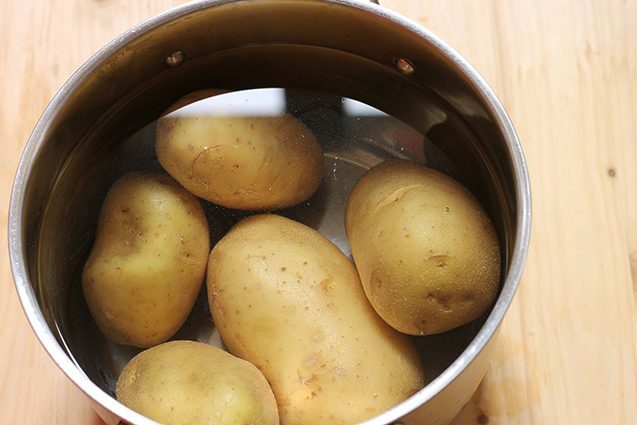 Boil the potatoes in plenty of salted water and bring them to a boil (1). Then remove the potatoes from the water and, still warm and without peeling them, cut them in half and place them in a potato masher (2). Then put the mashed potatoes in a pot and cook them on low heat. Add a knob of butter, cheese, salt and pepper. Mix well and add the milk little by little until the ingredients are well mixed and the desired creaminess is obtained (3). Put the mashed potatoes in a baking dish, spread some flakes of butter and grated Parmesan cheese over and cook au gratin for about 5 minutes, until it is golden on the surface. Serve the warm mashed potatoes with a good glass of red wine. 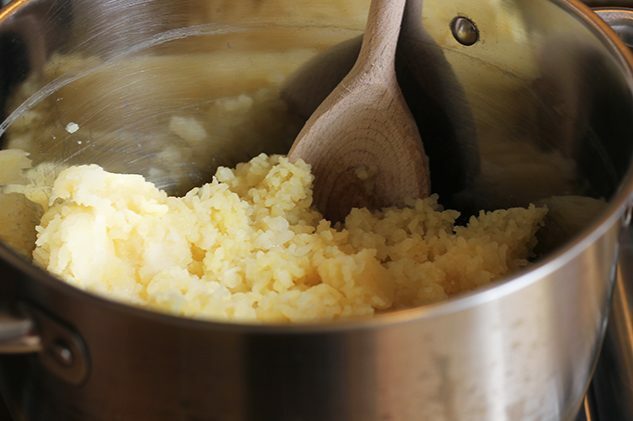 – In case your mashed potatoes are too liquid you can thicken them by boiling other potatoes and adding them during the preparation and cooking them until they are no more liquid. Add milk until you get the desired consistency, starting from the doses of the recipe. The more creamy you want the mashed potatoes, the more milk you have to add. 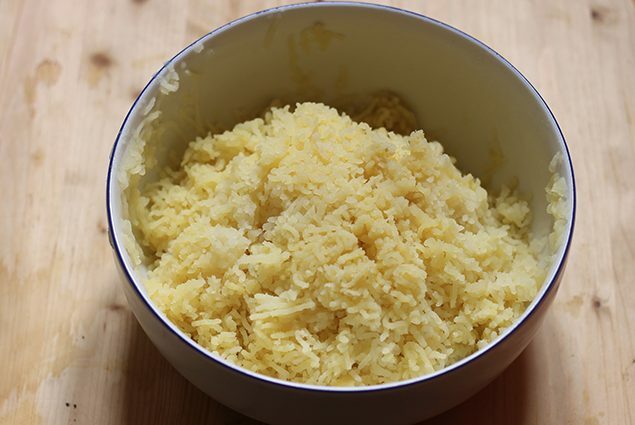 – To make your mashed potatoes more special you can flavor it with two tablespoons of fresh grated ginger if you serve them with fish, in fact the two flavors can be perfectly combined, or you can flavor them with some sage or rosemary leaves if you serve them with a more tasty meat. 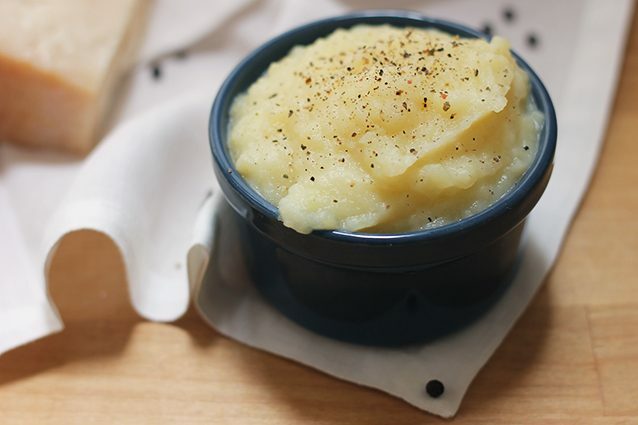 Mashed potatoes can be perfectly preserved for about 3 days in the refrigerator in an airtight container. They can be frozen in single portions, but first you have to wait they have cooled down. If the mashed potatoes are too thick, add a small glass of milk.